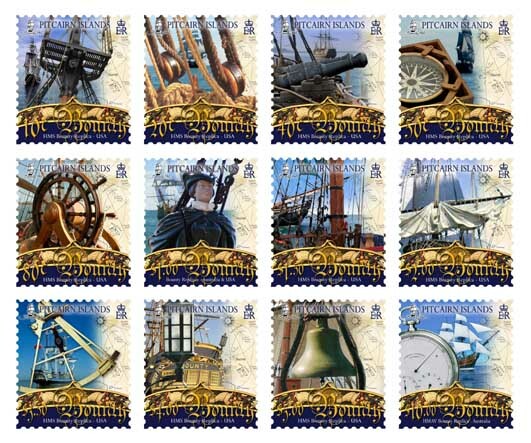 Click on a stamp to enlarge it. Around 1780 the British Navy was made up of more than 600 ships of various types, yet the Admiralty considered none of them suitable for the planned breadfruit expedition. A ship had to be found which could be converted to a floating greenhouse. Six merchant ships were considered and of them the Admiralty chose the Bethia, built two and a half years earlier. She was a three-masted, full-rigged, snub-nosed ship of only 215 tons burden and had been used only for coastal trading. The Navy Board bought her in May 1787, for £1950 and on the suggestion of Sir Joseph Banks, renamed her Bounty. The Bounty, considered by many as too small and cramped for a long mission, was only 215 tons, with a deck length of 90 feet, a breadth of 24 feet and a draft of 11 feet, (in comparison, Captain Cook's ship Endeavour weighed 368 tons and the Resolution 462 tons). She had no superstructures; all accommodation and facilities were below deck and her masts varied in height from 48 to 59 feet. The refitting was costly. The bottom of the hull was sheathed in copper plate to protect the wood from wood-boring worms. The great cabin aft, normally reserved for captain’s quarters, was extended to a third of the length of the ship in order to house over 600 pots for the breadfruit plants. Although the Bounty may have been small for her mission, it certainly appears that no expense was spared in preparing her for the voyage: the total bill for the refitting came to £4456, more than twice the purchase price. 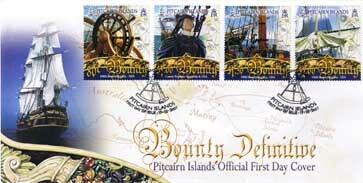 The Bounty was commissioned on June 8, 1787, and Lieutenant William Bligh was appointed commander on August 16. 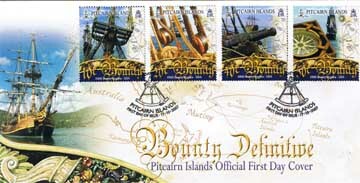 The replica Bounty on which this stamp issue is largely based is that which was commissioned by the film studio MGM in 1962 and later donated to charity by Ted Turner. From 2002-2007 she has been undergoing a $3M restoration but still managed to feature in the Pirates of the Caribbean series. She has just completed the voyage to the UK where the ship is scheduled to commence a repeat of the famous voyage of the original Bounty to Pitcairn and Tahiti. The original HMAV Bounty featured many items of ‘detail” that make the ship intriguing to many followers throughout the world. She carried a sextant, compass and, for armament, the Bounty received four short-carriage four-pounders and ten half-pounder swivel guns. Other detail included the twin carved fruit urns on the stern; the beautiful lanterns; the crows’ nest and, under the bowsprit, the figurehead portraying a woman in a riding habit. Perhaps the most interesting item of all was the ship’s chronometer. Captain James Cook carried with him on his 2nd and 3rd voyages, Kendall's "official" copy (known as K1) of Harrison's H4 Chronometer. Cook's experience proved that a chronometer could give seamen the means to accurately determine longitude (i.e. determine their correct location). Although costly, Kendall suggested that he could "construct a timekeeper upon Harrison's principles, for the sum of £200." This was completed in early 1771, known as K2 and eventually passed to Captain Bligh in 1787. 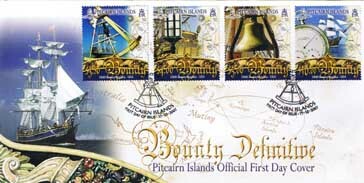 On Admiralty Charts, Pitcairn Island was charted inaccurately but, as the mutineers had the K2 chronometer, they were able to determine their longitude. Although they knew that future expeditions would also have chronometers, they gambled that these expeditions would not be able to find Pitcairn and so decided to settle there. After the mutiny, the Chronometer remained with the mutineers on Pitcairn until Captain Matthew Folger of the US whaler Topaz discovered the survivors, including mutineer John Adams, in 1808. Folger “purchased” the Chronometer for a small silk handkerchief. There followed an incredible history after which the Chronometer was returned to Britain and is housed today in the National Maritime Museum in London.